Nearly everything we know about Peter A. Brazinski and the history of this march comes from two letters (see below) sent to CUA in 1937. 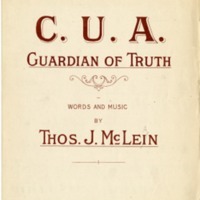 A Polish-American military band musician with, presumably, little experience in composition and no known connection to CUA, Brazinski wrote a march for CUA and gave it as a gift. The original package was addressed to the Glee Club, and a pencil marking shows that it was sent to Dr. Leo A. Behrendt, director of the Glee Club. It seems clear from the second letter that he in turn passed on the parts to CUA Bandmaster, Paul D. H. Leman, who wrote to the composer informing him that they would perform the march. As far as we know, it has never been performed. Our conjecture: It seems that no score was sent, only parts. Thus, it would be difficult for Leman to assess the work without a reading by the band. The parts are copied in beautiful script, giving a false impression that Brazinski was a trained composer; therefore, one can understand why Leman would promise a performance. It must have been an interesting rehearsal the day they read through the work for the first time. I am mailing to Catholic University a New March which I Respectfully named "Catholic University MARCH". While composing this march it was my desire to select most melodious and brilliant tunes for it. The melody written in Dominant Fifth degree. I Sincerally believe it is good arrangement also in right Key - Bb major concert pitch - which may be used for vocal singing. For that porpose you will find the TRIO of this March has very suitable theme for singing. The words may be arranged to that song according you wish. I beg to state that this new march never has been tried by band and there might be some misplacements of notes which need correction. Please - as you play it for the first time - take a pencil and mark all notes which need replacement. This - 3d, Field Artillery Band is very busy at present time - we having annual Horse Show during winter and other duties which runs on scadule and there is hardly any spare time so I may use Band to try out this new march. I am sure your Bandmaster will put final adjustments in this new march . The Band and Orchestra Dir4ctor of Catholic University is well known amongs Musicians in the United States of America. Maybe someday I have pleasure to meet your Director in person and thank him for his kind cooperation in developing this new March to a beutifull number. The Catholic University of America have full rights to publish this new march under own copyright law. Your letter received and I am very pleased knowing that your Band is going to play this new march which I mailed t you . I know that there are plenty work left unfinished in that march . I kindly ask you to rearrange whole march according you find to be necessary make final adjustments. Arrangement will be accredited to you with your name printed on march when it receive publication. I kindly suggest that the Catholic University publish this march after it been finally rearranged and adjusted perfectly for public performance. I sincerely hope all bands would like to have a printed copy of this march because it has plenty room for further development to make this a good number. Some parts you find O.K. but other parts have to be rearranged on smaller intervals because larger intervals are good only for big Bands but if secondary harmony arranged on smaller intervals it is suitable for small and big bands. I will not ask to return this march and will be pleased if I can serve something to Catholic University. Your kind work on this march deserving full credit.